Noel Buckley, a recognized Niagara Falls, Ont. hospitality industry leader, is returning to Southern Ontario to run the Scotiabank Convention Centre. Buckley, 55, has been named the convention center’s president and general manager, filling a position that had vacant for nearly 20 months. Buckley was selected for a national headhunting search. He begins his new Niagara Falls tenure next month. Terms of his new contract were not disclosed. 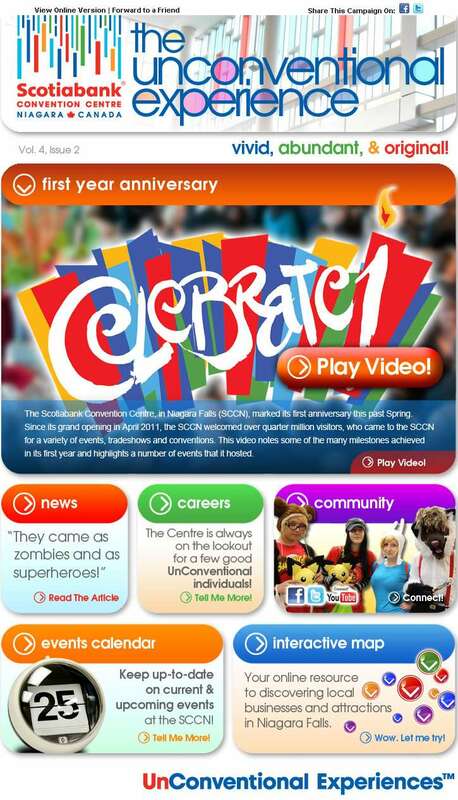 I recently received the latest newsletter from the Scotiabank Convention Centre Niagara Falls. Employees at the Scotiabank Convention Centre could be excused for wanting to have their cake and eat it, too. Staff were marking the centre’s second anniversary, and a brief cake cutting ceremony was held to celebrate. Mayor Jim Diodati joined board chair Wayne Thomson and SCCN president and general manager Kerry Painter to help divvy up the cake. “The Scotiabank Convention Centre continues to prove its worth to our city,” Diodati said. It’s not about competition. It’s about complementing each other. With news this week Nelly Furtado and Hedley will headline the Niagara Parks Commission’s free New Year’s Eve concert at Queen Victoria Park, organizers at the city’s convention centre say it will go hand-in-hand with the Deadmau5 show at the Stanley Ave. facility. Earlier this week I received the latest newsletter from the Scotiabank Convention Centre Niagara Falls. Last week I received the latest newsletter from the Scotiabank Convention Centre Niagara Falls. The Scotiabank Convention Centre has been open just short of a year now, and on Friday night I had the opportunity to go for the first time. We went to see the Busytown Busy show with our kids. I’ll write about that later, but for now, here are a few thoughts. The convention centre is beautiful! I was actually quite surprised. I’ve been to a few other ones, and I kind of expected that this one wouldn’t be as nice as some of the others I’d been with, but I was wrong. It is gorgeous, and the limited part of the building that I saw was just as nice as any other one I’d been to. There is a huge parking lot behind the convention centre. I wasn’t sure if we’d be charged for parking or not. We were, but it was only $2. On the one hand, it seemed like it was so low, why did they bother (it kind of felt like they were charging us just because they could). On the other hand, no one had a problem handing over a Twoonie instead of a $10 bill. If you’ve seen the building, you know there are a lot of windows. It is great when you are inside to have all of the natural light coming in. My wife couldn’t put in to words what she thought of the place, other than it was clean and modern, and it made you want to be there. The performance we were there to see was in the Fallsview Theatre. I had heard previously about another show when there were audio problems, but on Friday the sound system was great. No complaints whatsoever. I took a few pictures while I was there. As always, you can see the thumbnails below, and you can view them along with larger versions of the photos in the Scotiabank Convention Centre in March 2012 gallery. Earlier this month I received the latest newsletter from the Scotiabank Convention Centre Niagara Falls.